accordance with N.A . 84. This book is the initial draft of the ill-fated 1928 Prayer Book of the Church of England. 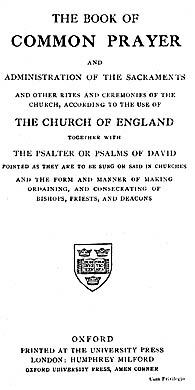 It is the result of a long process extending back 20 years to revise the 1662 Book of Common Prayer. Initially the revision was only to concern rubrics, so as to reduce tensions between the Evangelical and Anglo-Catholic parties of the Church which had, on occasion, resulted in embarrassing trials in secular courts. However, the enormous social upheaval caused by the Great War (World War I) brought about demands for greater changes, both in language and theology. These were largely voiced by Anglo-Catholic clergy who had served as chaplains in the war and in urban slum parishes, and found that the lay-people they encountered had great difficulty relating to the 1662 BCP, and that it had significant limitations. This book was the initial result, and, unfortunately, it largely ignored those who initially fought for changes. This draft resulted in responses for further changes by certain groups: a "Green Book" from strong Anglo-Catholics, an "Orange Book" from moderate Anglo-Catholics, and a "Grey Book" from a more liberal group. Note that Evangelicals had no response; they generally preferred no change in the 1662 book. The changes in the Draft Book nearly all point in an Anglo-Catholic direction, due to the rise of this group over the previous 80 years. Morning and Evening Prayer are little changed (other than an alternative ending to Evening Prayer), but a Compline service is added - although it wasn't called that. In the Communion service, an oblation is added similar to that in the U. S. BCP, and, in perhaps the most controversial change, Reserved Sacrament is allowed for the first time. An alternative Baptismal rite is added, and also several Burial rites for use in special circumstances. The 1923 Draft is presented here in two forms. The entire book is available as PDF graphics (as in Google Books and the Internet Archive) with extractable text. This text has not been proofread and undoubtedly contains errors. Additionally, the main services, plus those with significant changes, are presented as HTML text; see the links in the Table of Contents at left. This book appears as 1923/1 in David Griffiths' Bibliography of the Book of Common Prayer.